Intuit created software “hooks” between Quicken and TurboTax. 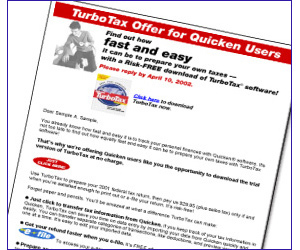 This made it push-button simple for people to transfer personal tax information from Quicken into the TurboTax software. The challenge was in convincing Quicken users that it really was “push button” simple. We took the approach of making a very straightforward offer of a free trial download of TurboTax. Then Quicken users could transfer their personal data to TurboTax — see how their tax return would look — and they only had to pay for the software when they wanted to print or eFile their return.